This 12-frame mosaic provides the highest resolution view ever obtained of the side of Jupiter’s moon Europa that faces the giant planet. It was obtained on Nov. 25, 1999 by the camera onboard the Galileo spacecraft, a past NASA mission to Jupiter and its moons which ended in 2003. NASA will announce today, Tuesday, May 26, the selection of science instruments for a mission to Europa, to investigate whether it could harbor conditions suitable for life. The Europa mission would conduct repeated close flybys of the small moon during a three-year period. 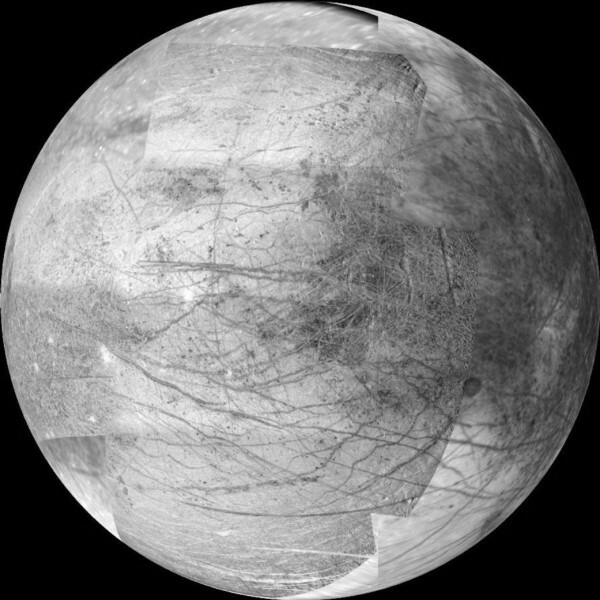 Numerous linear features in the center of this mosaic and toward the poles may have formed in response to tides strong enough to fracture Europa’s icy surface. Some of these features extend for over 1,500 kilometers (900 miles). Darker regions near the equator on the eastern (right) and western (left) limb may be vast areas of chaotic terrain. Bright white spots near the western limb are the ejecta blankets of young impact craters. North is to the top of the picture and the sun illuminates the surface from the left. The image, centered at 0 latitude and 10 longitude, covers an area approximately 2,500 by 3,000 kilometers. The finest details that can discerned in this picture are about 2 kilometers across (about 1,550 by 1,860 miles). The images were taken by Galileo’s camera when the spacecraft was 94,000 kilometers (58,000 miles) from Europa.